I thought I’d try something a little different this time with the pre-release of Dragon’s Maze. The set is almost entirely multicolor, which means it would be pointless to break down each color to talk about what I’d use in the pre-release. Instead, I’m going to do what most other reviewers are doing and just lump everything into the Guilds. Being Wednesday as I publish this, I’m definitely going to be behind and probably won’t get all this “limited” information out before my first Friday night pre-release. I’ll do my best though. For those of you reading this the first time “Playing to your Weaknesses” is a series of articles I write during each set release that covers which uncommons or commons I think are going to be best in the limited format (booster drafts and sealed). I might not always be right, but at least I get you thinking about it. For those of you that don’t already know, the Dragon’s Maze pre-release is going be made up of 4 packs of Dragon’s Maze, 1 Return to Ravnica guild pack, and 1 Gatecrash guild pack. What are the guild packs you say? The guild packs are 15 cards that are all related to your guild. If you choose Azorious, your guild pack will be Azorious cards from RTR. If you choose Simic, your guild pack will be various Simic cards from GTC. Whichever guild you choose, the other one will always be randomly selected as an “Ally” guild. That means If you choose Azorius, you can get another pack that shares one of the colors with it. That means you could get Dimir (UB), Selesnya (GW), Simic (UG), Orzhov (WB), Boros (WR), and Izzet (UR). This will happen with any other guild you choose. It will definitely lead to some interesting combinations, and you’ll definitely want to be playing with 3 colors (even if the 3rd color is just a splash). Ok, do you have all of that now? Before we continue, I want to let you know that I covered all of the Gatecrash and Return to Ravnica cards before in previous articles, and while my choices weren’t always 100% correct, I still think it’s a good idea to look over the suggestions again. Instead of linking you to 20 articles here, I’ll just link you to the page that has all of the “Play to your Weaknesses” articles. Click on the keyword in the last sentence to browse through them. We don’t have any time to waste, so let’s get started. My first pick from the set is Ascended Lawmage. While it’s no Geist of Saint Traft, I think it’s an amazing card in limited. Four mana for a 3/2 flyer with hexproof is value. One thing I noticed in Gatecrash and Return to Ravnica was that there was a lack of decent flyers in the format. Sure Selesnya has bird tokens, and there are larger flyers at 6 mana, but for 4 mana I like this creature a lot. It can’t be killed by removal spells like Angelic Edict or Grisly Spectacle, but Devour Flesh can still take care of it. I think this card would be good in a Selesnya or Simic deck with other flyers to support it, and if you can pump up its power via some Simic cards, even better. I’d definitely put this card into any Azorius colored deck, and it would be a good pick in draft as well. A 2/2 body on a 2 mana creature is solid, and if you add in flash it makes it even better. For a common this is pretty darn versatile. The other ability also allows you to save a creature from death which can come in handy in a number of situations. Nothing will make your opponent angrier than using removal to get rid of your creature only to find that it’s wasted when this guy saves him. It’s also a good try to have your opponent use a big bloodrush creature on your creature to kill it, only to have the damage go nowhere. Simic would be a good fit for him because he’ll allow you to drop your big creatures on the ground again to activate that evolve trigger, and it would even be good with Orzhov to activate extort triggers once more. The Deputy will be doing a lot of work come Saturday, and in the limited format I’d expect it to be a solid middle pick around turn 4 in a pack. Azorious just gets all of the best lockdown cards. There’s Arrest, Detention Sphere, Azorius Charm, and Inaction Injunction, and if you add this in there’s quite a few cards that can shut down your opponent. It might be possible to run a decent control deck with Esper or Izzet, but even if you decide to run this in your main board it should still act as decent removal for those faster creatures on turn 2. Shutting down a Boros or Rakdos creature early on could be what makes or breaks a game, and I think Runner’s Bane will do a good job of slowing down your opponent while you build up your board. If you add in some Cipher cards from Dimir like Binding Grasp, you could totally shut down an opponent early on. He’s vanilla, he’s a 2/2, but he’ll get the job done and beat out other slower flyers coming in on turn 6 or 7. I always like to have flyers in my deck, because evasion is incredibly important in limited. He won’t win any “cool” contests but he should get the job done. Not a first pick, but a good mid-late pick in draft and can help fill out those last few spots in sealed. While I’m never a big proponent of life gain cards, I think this could have some great applications in sealed, especially if you’re going up against a lot of Golgari decks using scavenge. It’s a good sideboard card against those types of decks in the late game, and also works really well with a Dimir deck that can mill a lot of cards quickly. I also like how it can be splashed in any black deck you want. Not a card you want to put in your main board, but not a bad card to have just in case either. The Haunter is a solid Dimir card. Dimir has been lacking any cards with decent bodies but with the Haunter you get both a good defender and an effect that weakens opponents. Think of him as a Smog Elemental but much better. This would be a great card in a Esper (BWU) deck in sealed, but he could also be a role player in a Simic/Dimir deck or an Izzet/Dimir deck to give you the edge. He’d be even better if he had flying, but I still think he’ll be useful in your deck. I’d definitely have him in my 23 cards for sealed in a BUG or BWU deck, and I’d probably even take him early in draft if I was going for a Dimir deck. Absolutely amazing card. Talk about locking down an opponent. You can turn off their mana to stop a spell from being cast, you can untap your own creature to block after attacking, or you could tap two of their creatures to allow for an attack. Once you start casting it for free after an attack, you’ll be able to add two extra mana to your mana pool which will be incredibly useful. Great card to put on the Ascended Lawmage or somebody else with evasion such as Elusive Krasis. 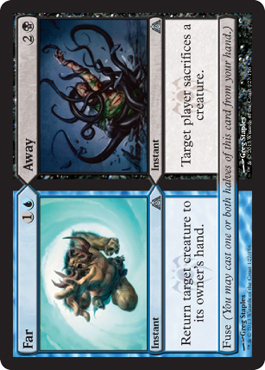 I like this card in BWU lock down decks, but you can fit it into Azorious, Simic, or Izzet as well. It’s a solid card and will allow you to abuse quite a few things in limited. I definitely think this would fit into my 23 cards if I was running blue. Divination was 3 mana and drew you two cards, and Mind Rot was 3 mana and made your opponent discard two cards, but Pilfered Plans is only 3 mana and does almost the same thing (from their library instead of hand which is slightly less powerful). It’s great in limited, especially if your going with Grixis (BRU) or Esper since there is a decent amount of card draw in those colors already. Along with Simic in a BUG deck, you could be drawing massive amounts of cards with Fathom Mage, Zameck Guildmage, and quite a few other cards. If you’re running blue and black, definitely consider this card in your 23. Divination is definitely playable, and so is this. You can expect quite a few players to fall into the Gruul camp during pre-release to get their hands on those big creatures with bloodrush, but this little guy can be your knight and slimy armor. It can’t be blocked by Simic, Selesnya, Gruul, or Golgari creatures, and he’s a great candidate to slap a Ciphered spell on. Yes he can be killed easily by a red burn spell or destroyed by a black spell, but you’ll definitely get some use out of him and he’s a great creature to have early on against aggressive green decks (which you can be sure to see a lot of). Pump him up with Simic and you have quite a good hitter on your hands. Good two drop in a BUG or Esper deck I think. Totally looked over this far the first time, but this is pretty damn awesome. It acts as either an unsummon or a Devour Flesh (minus their life gain of course), which is useful if they have a massive blocker and a tiny one and you want to kill that big creature. The Unsummon ability is good in a variety of situations (returning a Bloodrushed card to owners hand, saving your creature from death, getting rid of a Centaurus token for goo), and having your opponent sacrifice a creature means it gets around cards with hexproof if they are the only one on the battlefield. This is a first pick if you’re playing black, and especially if you’re splashing Dimir colors. I’d definitely put this in any Black deck I was using, and maybe even splash blue for the Fuse cost. Riot Control – Good sideboard card against aggressive decks if you’re going for control or a late game win. Murmuring Phantasm – huge body for 2 mana. Good way to set up a defense if you’re going for an alternate win or just need some breathing room. Am I missing some cards that you think should be in there? Well, if you don’t see a card here yet, it’s because I categorized it as part of another guild. I have 8 more to go, so I’m sure you’ll see the card sooner or later. Just a reminder, but these are only the commons and uncommons that I think are good in Dragon’s Maze. I’ll be covering the rares later on in my “Impact on the Metagame” series to come after the set is released on May 3rd, so stay tuned for those. With Azorius and Dimir done, I think the next two guilds will be Rakdos and Boros. I should have that post out in less than a day, so be sure to check back before you head to bed. If you’d like to comment or make some suggestions for these guilds (ie combos), please feel free to write something down below. Thanks for reading! I believe you can only be allied with guilds in the opposite set that you chose… So in your example, if you choose Azorius, you will only get another pack that shares one of the colors and is from Gatecrash, so Dimir (UB), Simic (UG), Orzhov (WB), Boros (WR). For each guild you pick, there should be 4 possible ally guilds. Thanks for the great article! Looking forward to the rest!